After convicting a superior for corruption and shooting off a gangster’s crown jewels, the career of Hamburg’s most hard-bitten state prosecutor, Chastity Riley, has taken a nose dive: she has been transferred to the tedium of witness protection to prevent her making any more trouble. However, when she is assigned to the case of an anonymous man lying under police guard in hospital – almost every bone in his body broken, a finger cut off, and refusing to speak in anything other than riddles – Chastity’s instinct for the big, exciting case kicks in. Using all her powers of persuasion, she soon gains her charge’s confidence, and finds herself on the trail to Leipzig, a new ally, and a whole heap of lethal synthetic drugs. 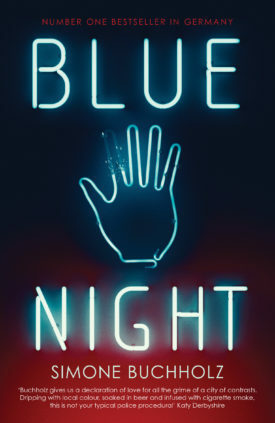 When she discovers that a friend and former colleague is trying to bring down Hamburg’s Albanian mafia kingpin single-handedly, it looks like Chas Riley’s dull life on witness protection really has been short-lived … Fresh, fiendishly fast-paced and full of devious twists and all the hardboiled poetry and ascerbic wit of the best noir, Blue Night marks the stunning start of a brilliant new crime series.